Around thirty members of the Shakespeare Club enjoyed a delightful Midsummer’s Night event at Charlecote Park on 21 June where we were able to stroll around the gorgeous grounds on a perfect sunny evening before enjoying a buffet meal and entertainment on the theme of Shakespeare and Charlecote provided by some of our own talented members, scripted and presented by Susan Brock. The Club is now on its summer recess, with lectures beginning again in October. We are excited to announce that our President for 2018-9 will be the controversial former Artistic Director of Shakespeare’s Globe, Emma Rice. The full programme for the year includes a mix of talks on Shakespeare on the stage, in history and on his importance to contemporary life, given by a wide range of expert speakers. Reminders will be sent out later in the summer, and anyone interested can join the mailing list from our Find Out More page to ensure you don’t miss out. On 21 April the Shakespeare Club took part in Stratford’s traditional Birthday Celebrations. Members of the Committee walked in the procession under the Club’s banner and unfurled the Club’s flag before continuing to Holy Trinity Church where the Club’s wreath was handed over to be displayed in the chancel with the other floral offerings. More than thirty members of the Shakespeare Club enjoyed the Birthday Luncheon held at the Crowne Plaza Hotel, the highlight of which was the speech given by actress Jane Lapotaire in accepting the Pragnell Award. In accordance with tradition, the Shakespeare Club took part in Stratford-upon-Avon’s Birthday Celebrations (Shakespeare’s 453rd) walking with our banner in the traditional floral procession on the morning of Saturday 22 April. The Club reserved two tables for members at the Birthday Luncheon held at the Crowne Plaza Hotel and were delighted to be mentioned by the Mayor, Juliet Short, in her address. Our new pop-up display was also seen in the foyer of the hotel over the lunch period. We also had a presence at other events over the weekend with a bookstall and display at the Bardsnight event on 21 April and at Stratford Literary Festival on 23 April. Since the Birthday, Susan Brock and Sylvia Morris have continued to promote their book on the history of the Club to U3A in Stratford-upon-Avon and at the Old Slaughterhouse for Escape Arts. 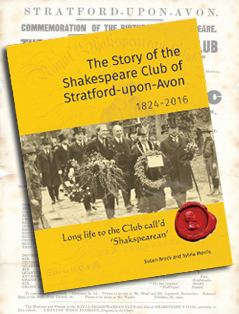 The Story of the Shakespeare Club of Stratford-upon-Avon 1824-2016: Long Life to the Club call’d “Shakspearean” will continue to be available at all Club meetings. Susan Brock and Sylvia Morris have taken on a number of events to publicise the Shakespeare Club in the wake of their publication The Story of the Shakespeare Club of Stratford-upon-Avon 1824-2016: Long Life to the Club call’d “Shakspearean”. One of the most successful of these was a presentation given to more than twenty Friends of the Shakespeare Birthplace Trust on the afternoon of 24 January, when original archives and artefacts of the Club were put on display by members of the SBT Collections Department. Items such as the magnificent glass goblet presented to the Club in 1830, rosettes from the 1930s, publications describing the early celebrations organised by the Club and a selection of minute books, medals and photographs, were bought out from the vaults at the Shakespeare Centre for this special talk. We are grateful for the assistance of Stratford-upon-Avon Town Trust in making this possible. Further events are already booked and Susan and Sylvia are happy to give talks and presentations to interested groups. They can be contacted at stratfordshakespeareclub@gmail.com. The Club’s meeting on 10 January 2017 was a talk from Sir Richard Eyre, our President for the year who had by coincidence just been made a Companion of Honour in the Queen’s New Year Honours List. It's a great recognition for a lifetime's devotion to the performing arts including drama, opera, television and film work. Best known for being Artistic Director of the National Theatre from 1987 to 1997, while there he directed the famous production of Richard III starring Ian McKellen, set in 1930s Germany, and that of King Lear starring Ian Holm. Other directing credits include productions of Hamlet, one starring Jonathan Pryce, another starring Ian Charleson. More recently, and on TV, he directed Henry IV, Part 1 and Part 2 as part of The Hollow Crown series that was screened by the BBC in 2012. His talk to the Club, entitled “Shakespeareana”, treated members and visitors to an inspirational insight into what Shakespeare means to him and to those he has encountered during his professional life including audiences around the world. This was one of the most successful evenings in the Club’s recent history and a real privilege for those who were there. On Monday 29 November 2016 we held the official launch of the book The Story of the Shakespeare Club of Stratford-upon-Avon 1824-2016: Long Life to the Club call’d “Shakspearean” <link to Our Book page>, written by Susan Brock and Sylvia Morris. It was an opportunity to celebrate the way the Club’s story is entwined with the history of the whole town and some of its most important organisations. Several of them, including King Edward VI School, the Shakespeare Institute, and the Swan of Avon Masonic Lodge were represented. Our most honoured guest was Juliet Short, the current Mayor of Stratford-upon-Avon. It’s appropriate she should have been there: she follows in the footsteps of Annie Justins, Stratford’s first woman mayor and ex officio president of the Shakespeare Club, shown on the cover of the book carrying the Club’s wreath in 1930. The launch was held in the Shakespeare Birthplace Trust’s bookshop, where the book is now on sale. In 2016 the World Shakespeare Congress held its five-yearly international conference in Stratford and London, attended by over 800 delegates. To mark this event, on 1 August the Shakespeare Club hosted a tea at Holy Trinity Church for speakers and seminar leaders with past presidents and members present to introduce them to the Shakespeare Club and its history, reinforcing old friendships and making new contacts. During a meeting in 2015 it was suggested that the club could sponsor visits to Stratford by trainee teachers, enthusing them for the life and works of Shakespeare and thereby enhancing their future teaching of Shakespeare in schools. In June 2016 this was put in place with Emma Dawson and Marie Solomon being hosted by committee-members to a performance at the RSC and a visit to Shakespeare’s Birthplace. Feedback was so positive that it is hoped this will become a regular event in the Club’s timetable. To mark the double celebration of the 400th anniversary of Shakespeare’s death and the 200th anniversary of the first Stratford celebrations of his birth, on Saturday 7 May the Shakespeare Club held a luncheon at the Falcon Hotel, where the Club had been founded in 1824. The date itself was selected in order not to clash with the extremely busy Birthday weekend itself. The Club had originally been founded to hold a “periodical meeting, and to pay an annual tribute to [Shakespeare’s] memory by a public dinner on his birth-day”. With this as its starting point, it’s perhaps strange that for many years the Club has not had a meal together, its monthly meetings instead consisting of lectures given by visiting speakers. After enjoying lunch, the members were treated to a series of entertainments, almost entirely delivered by the Club’s talented members. Mr Robert Lister, dressed in Victorian splendor, was the Master of Ceremonies and Toastmaster. Roger Taylor and Tasha Moss sang one of Shakespeare’s songs as well as leading the singing of the National Anthem and songs including Garrick’s Warwickshire Lad, first sung in Stratford in 1769. There were readings from the Chairman of the Club, Jean Lawrance, from Jane Taylor, and from James Stredder. Thanks to all of them and especially to Susan Brock, the Club’s Secretary, who undertook most of the organization of the day. On 23 April 2016 members of the committee of the Shakespeare Club took part in the traditional Stratford-upon-Avon celebrations for Shakespeare’s Birthday. The Club was allocated a position high up Bridge Street, in acknowledgement of its historic role in the organisation of the Celebrations. After pulling the Club’s own flag, Club Chairman Jean Lawrance carried the traditional laurel wreath from Bridge Street down to Holy Trinity Church where it was laid beneath Shakespeare’s monument amidst the thousands of other floral tributes. The Club celebrated its 900th meeting on 9 February 2016. Members raised glasses of sparkling wine to toast the prosperity of the Club, looking forward to its 1000th meeting which will take place, at the current rate of 8 meetings a year, in 2028.